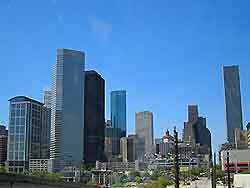 An epic Texan city filled with accommodation, hotels in Houston are fairly expensive, thanks in no small part to an especially hefty hotel tax, which is amongst the highest in the USA. Chain lodging is commonplace in the city and therefore if you are looking for a specific brand, then it is quite likely that you will find it in Houston. The George Bush Intercontinental Airport (IAH) is situated 22 miles / 33 km to the north of downtown Houston and comes with its very own selection of accommodation. Among the many hotels close to this airport are the Country Inn and Suites, the DoubleTree Hotel, the Hampton Inn, the Hilton Garden Inn and the Ramada, all of which reside on the John F. Kennedy Boulevard. 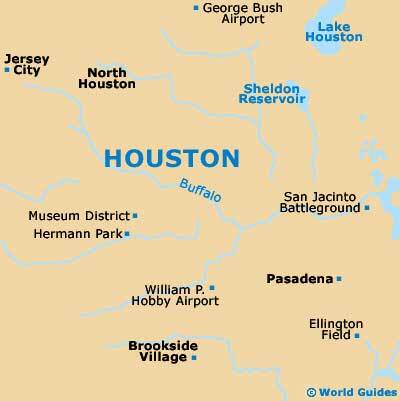 The Houston Hobby Airport (HOU), situated 7 miles / 11 km to the south of the city center, is a major domestic airport. Hotels close to this airport tend to line the Airport Boulevard and include the Comfort Suites, the Country Inn and Suites, the Holiday Inn and the La Quinta Inn. Budget accommodation is fairly easy to locate in the city and backpackers will certainly favor the Houston International Hostel on Crawford Street, which lies within the Museum District and is a mere stroll away from Hermann Park. 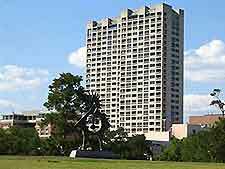 Cheap hotels in the area include the Super 8 motels located on both Kings Row (close to the NASA Space Center) and the North Sam Houston Parkway East, the Best Western Northwest Inn and the Red Roof Inn on the Northwest Freeway, and the Holiday Inn Express off the Katy Freeway at Dairy Ashford. 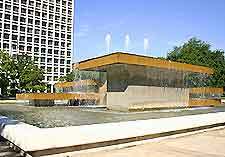 Mid-range lodging areas in Houston include the West Loop Freeway South and West Alabama. Consider accommodation such as the very centrally sited Crowne Plaza Downtown Hotel on Smith Street, the Embassy Suites Energy Corridor on the Katy Freeway (part-way between both airports), the Hilton Garden Inn Westbelt on the West Sam Houston Parkway South, and the popular Homewood Suites on the Wortham Center Drive, which stands close to the Texas Highway US-290 West. If your holiday in Houston is all about luxury, then four-star hotels are worth considering, since they provide a high standard of accommodation at very affordable prices. The Hotel Icon on Main Street falls into this category and this historic building was once home to bank headquarters, being conveniently close to the city's sports and theater districts. Also standing out is the recently renovated Hyatt Regency, which is within the heart of downtown and is near to Houston Park and the famous Wells Fargo Plaza skyscraper - one of America's tallest buildings.